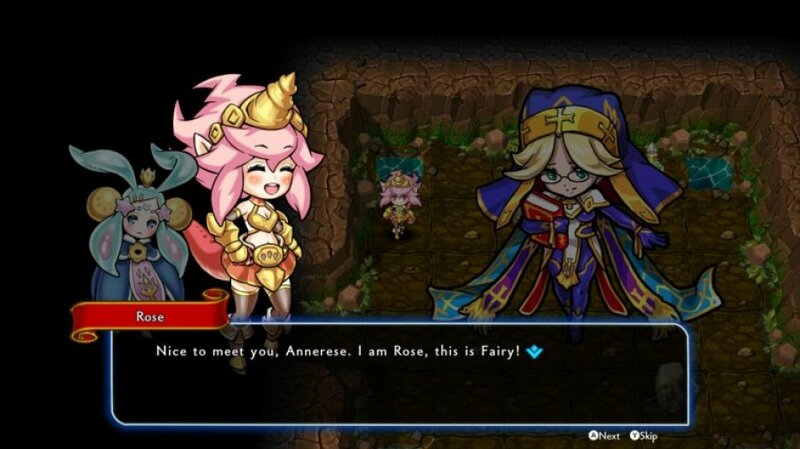 DragonFangZ - The Rose & Dungeon Of Time from Japanese studio Toydea, is an intriguing and charming mix of genres, utilising both the resource management systems and turn-based combat from traditional JRPG's along with elements such as randomly generated levels and permadeath from roguelikes. Although the game is in English with sparse Japanese voiceover, for a story and dialogue that's told through text, the localisation goes from laughable to incomprehensible on occasion. The actual explanation of the mechanics and different items is kept to a minimum, so there's a lot of research to be done if you want to make the most of its systems. While the setting is rustic yet polished, the central characters' hand-drawn Chibi Manga art style is almost sickeningly cute. 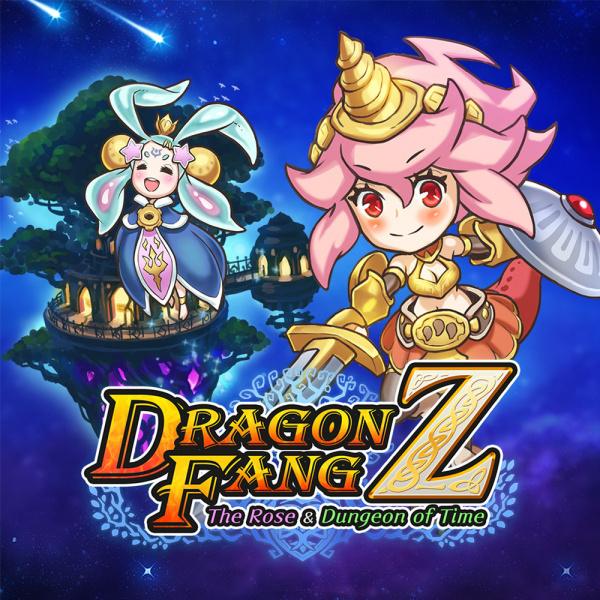 As the magical sound effects and suitably pleasant, jaunty tunes alternate every few floors, DragonfangZ - Rose & Dungeon Of Time oozes charm. There are 200 types of monsters and overall which, despite their limited animation, are crisp and vivid on-scree. Even if the protagonists over the top design is a little on the awkward side, everything looks good. 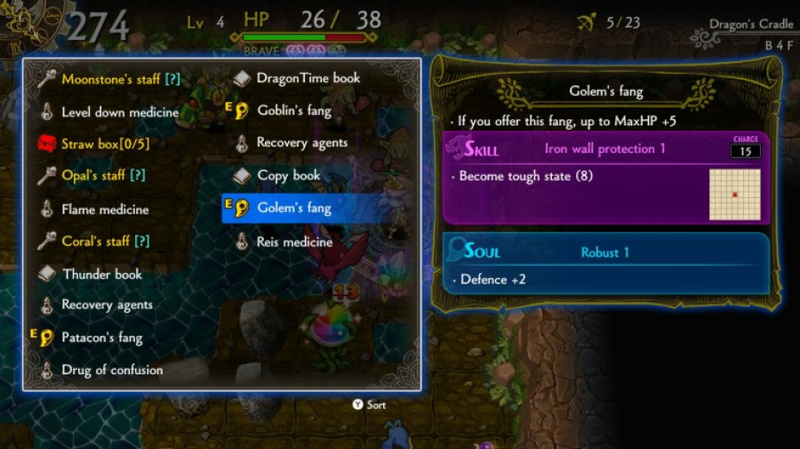 In addition to the main game, there is a tutorial of sorts called the Fairy Garden. This consists of 50 separate stages designed to teach you about various aspects of the games different mechanics, from spells and weapon usage, to strategy against groups of enemies. 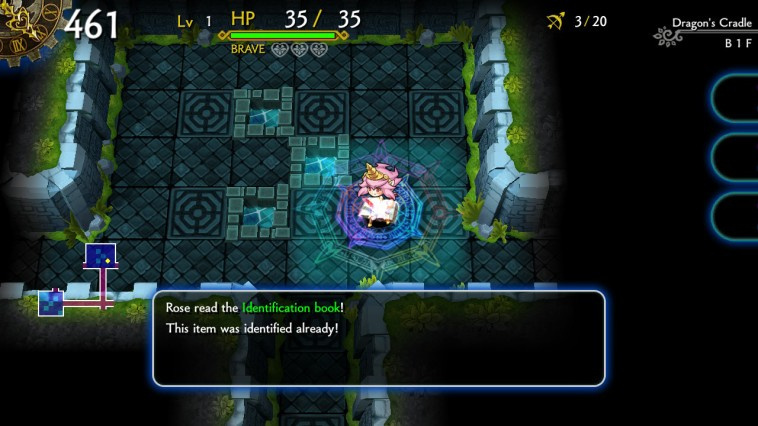 As the game's translation can be unintuitive to put it politely, these are useful lessons to set you up for your adventure. 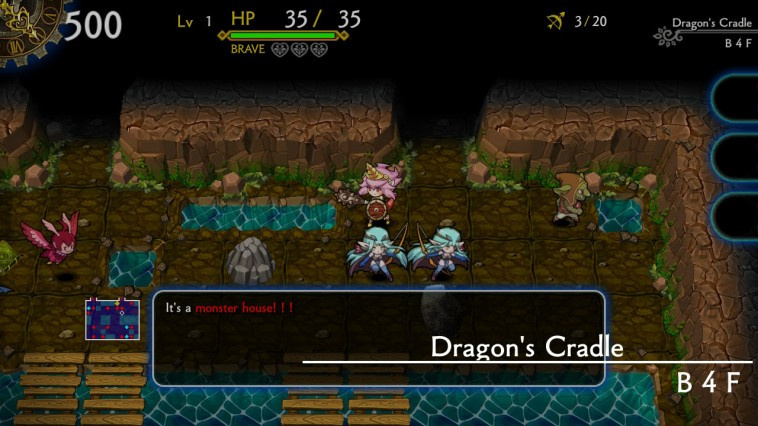 Initially, DragonfangZ might not look like a traditional dungeon crawling affair. Movement is brisk, taking on enemies and picking up items is quick and easy. It's possible that there are elements of the games mechanics that you won't even notice, but it won't take long before you're brought crashing back down. Each new floor has more powerful foes and more dangerous traps, each time learning how to use the items you collect. As with any contemporary roguelike, the levels being randomized inevitably is a double-edged sword. While you might gather a ton of items, they could be completely useless against a devastatingly powerful enemy, or in some instances an enemy off-screen using a bow and arrow was able to wipe Rose out in two hits before there was time to properly assess the situation. You can zoom in and out, but constantly alternating affects the game's flow. Similarly, the feeling of accomplishment and progression can be abruptly halted, as navigating corridors can be frustrating as it's easy to get blindsided or ambushed. It's important to balance exploration with efficiency, as being unprepared will get you mercilessly killed, yet there are only a certain amount of moves you can take before your health will start to reduce. Each turn-based level has a certain number of moves/ attack in order to reach the floor below. Dragon Time, located in the top-left of the screen, is a clock counting down the number of moves you have on a particular floor so it's an important feature that needs tracking. While it's possible to use the analog stick, we find it more accurate to use the D-pad, especially in situations that required more planning. There are traditional weapons, shields and various potions to find along the way. Pressing A will use a melee weapon or use arrows with R as a long range attack, in addition to accessing the item menu with X or quick access to your fang stash with ZR. Not everything you pick up is useful, though. You have to pay attention as there are poison potions as well as recovery potions. 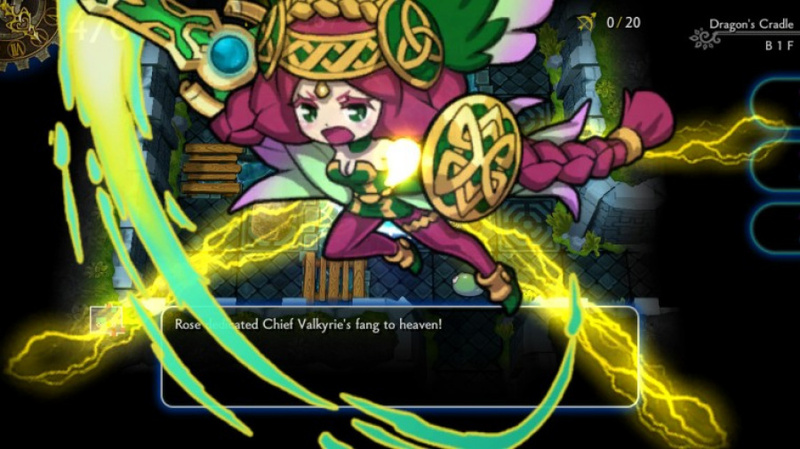 Likewise, weapons such as staffs can have unknown effects and levels of damage, sometimes even powering up or evolving enemies. Wearing the fangs dropped by enemies can be used in two ways - either use them straight away for a small but immediate benefit or equip and save them up for a more powerful attack that takes time. There's also the 'Brave system', which sees Rose's health restored every time she moves when there are no obstacles within an eight-square radius. Ultimately, DragonfangZ's systems become increasingly deep and varied the more you play and you will always be learning new intricacies. Balancing the strategy of offence and defence management with seeking the strongest combination of items and fangs to progress adds enough JRPG bite to the rougelike format, and with a ranking function to track all your decisions, an item warehouse for storing gathered trinkets and a monster database to catalogue all of your beastly encounters, there's a well fleshed out and enjoyable experience to be had. Good game, but if you think the current game is hard to understand you should have tried it on day one before the first patch. It was nigh incomprehensible in places, with some words completely different changing the meaning entirely, and other character lines were still written in the original Japanese. Good game though. As a fan of rogue-likes it's pretty good. More in-depth but less pick-up-and-play than Quest of Dungeons. I still would like to see a proper Shiren game released on Switch though. I'm really interested in picking this up as I'd love a Shiren the Wanderer game on Switch, but that's probably way off, if we even get one. Absolutely in love with this game. Granted, I'm a huge rogue lover, but this is my current favorite game on Switch. Well worth the price tag if you're like me. Would pick up if it goes on sale. I want a game like Shiren the Wanderer. Anyone know about how long the game is overall? An okay game, just that the girly anime art style turn me away. Well, the important question for me is, what's better, this or Touhou Genso Wanderer (which is already available on the JP eShop and will likely come to the west soon)? Just a correction on the "Brave" system: in typical roguelike, you'd want to fight enemies in a corridor so that only one would attack you at a time. But in this game, fighting enemies so that all eight adjacent tiles are empty of boulders and walls (water is fine) increases the Brave meter. Some weapons will have special effects when the Brave meter is at least two (say, attacking multiple tiles or causing the enemy to be dazed or such). And each turn Brave meter is above zero, the Fangs special ability is being charged up. So to be able to use the special abilities, you must increase "Brave" meter by taking a risk by fighting in a wide open space. I'm not sure if Rose really regains more health by being in open spaces? She heals pretty fast regardless, I think. EDIT: Fixed "multiple times" to "multiple tiles". Oh wow - this Goes on my Switch list for sure. Definitely interested in this. Still play Shiren the Wanderer every now and then on the DS, would be interested to know how it compares to that. Mediocre translation and permadeath in a randomly generated environment? Eh...I'll pass. I’m still on the fence over this. I like Pokémon Mystery Dungeon, but those games are far more forgiving since you don’t lose your levels if you die. I tried out Shiren on my Vita, but found it very difficult. Is the difficulty about the same as Shiren games? Or is it a bit easier? If it’s easier, I’d probably get it. I like a challenge, but I also avoid games that frustrate me too much as I prefer to relax when playing video games, since it’s my escape from the stress and frustration of the real world. This is the kind of game I never need to play. It’s not for every one but I love rpgs and thought that what I’ve played of it so far is quite cool. I like the idea of the Brave system. It bucks the tradition of playing rogue/roguelite/roguelike games safely. Or not, I guess, since the safe way should still be viable, yet more challenging. I'll pick it up somewhere down the road. Don't really have the time at the moment. I would buy a Shiren game for twice the asking price of this one. I'm not usually one to complain about occasional poor English in localized games, but some of the text in this one is incomprehensible to a point that it actually appears to hinder game play. I still might buy this if they continue working on the translations. For real, though: Shiren plz. This game is not for me, sadly. Also, just want to point out that the article could use more proofreading. "On-scree" and protagonists instead of protagonist's are only a couple of issues with the article. Maybe I will get it at some point, I do like Roquelikes after all, particularly turn based ones. But after playing through Xenoblade 2 I feel like I need stay off all anime for a while. @Kirbyfan your avatar is adorable!!! I am not sure what people's beef is with anime/manga like artstyles. Frankly I am kind of sick of hearing people whine about that. Unrelated complaints aside, at first this game sounded good to me, but the moment I read "randomly generated" it just went downhill from there. I don't like when the main gameplay is on randomly generated levels or terrain. I want that to be a skirmish mode, or a side feature. Just my personal preference there. And then hearing that the game gives sparse explanations on mechanics and items is another big negative for me. I should not need a fan wiki to know what items do, and this review suggests I might want to play with said wiki open on my phone at all times. Yet it still got a 7/10? This seems to support my growing opinion that everything on this site gets a 7/10 if it is not broken or excellent. @Heavyarms55 Going by the last 60 reviews listed on Metascore for NL, there were 17 sevens, 18 eights, eight nines and 11 sixes. Plus two fours and four fives. Personal opinion - this game far outclasses Quest of Dungeons (NL gave it 8/10) in every other field except the translation. And given the repeating nature of the item descriptions etc., the biggest hurdle is understanding the Brave system. 7/10 sounds pretty accurate — had the translation been well done, I would've given an 8. 9 might've been a bit too much. You still wouldn't like DFZ, though. @Pahvi Kudos for actually looking up the numbers. @Heavyarms55 The easiest way for me to contribute to the discussion Although, I should've split the scores between 3DS and Switch reviews and include all of December's reviews.